In the summer of 2015, James Sudder and his group from Calder High School Sixthform took part in our Care & Community project for two weeks in Colombo, Sri Lanka. The group worked in two kindergartens, working alongside teachers and staff, supporting the pre-school children with arts, crafts, drama workshops, English lessons, singing and games. During the afternoons the groups spent time working on improving the basic decoration of the school buildings with beautiful murals and painted furniture. The group were fortunate enough to experience much of the culture this wonderful country has to offer including the famous Kandyan dancing and visits to Buddhist Temples. A truly life-changing and memorable experience for all those involved. James Sudder, one of the students involved in the project, made the following video to give an insight into volunteering from a volunteers point of view. 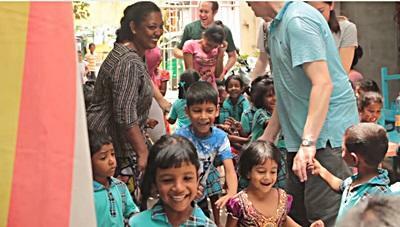 Read more about Care & Community in Sri Lanka.